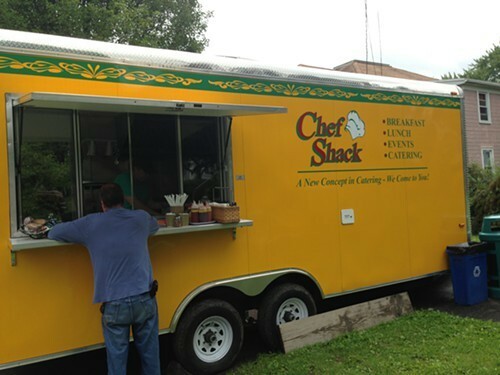 Have you seen the new food truck in Saugerties at 208 Ulster Avenue? I was in Saugerties on Wednesday running an errand when I remembered that I wanted to try out the new food truck which sits right across from the Lumber Yard. I met the husband and wife team, George and Emily, who own the Shack Chef Food Truck at the Monday Night Groaning table at Duo Bistro. George invited me to try a lunch special. Their menu has something for everyone. It is mostly New American gourmet cuisine. I ordered their quarter pound of smoked salmon on a bed of greens. (You have the option of having it on a house-baked brioche bun instead.) The $7.50 lunch specials include fries and a drink. My husband had the smoked chicken apple salad on greens with fries and a drink. The man who shared our picnic table with us said he was very pleased with his grass-fed burger. It was his second lunch at the Chef Shack Food Truck. Emily and George are passionate about their food and their new business, and it shows. The quality of the food is very good. I think it is comparable to a dish you would eat in a restaurant. 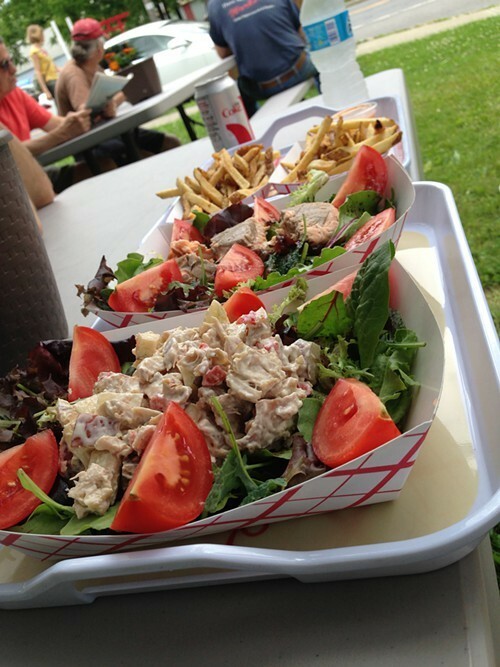 Chef Shack, Better Than Your Average Fare, 208 Ulster Avenue, Saugerties, NY (845) 453-2675. They do get busy at lunch time so if you are pressed for time on your lunch break, I'd phone your order in. They are only open Tuesday to Thursday 11am to 3pm at the moment. Find out where to eat, play, and recharge your spirit by following Vanessa Ahern's blog, Hudson Valley Good Stuff.